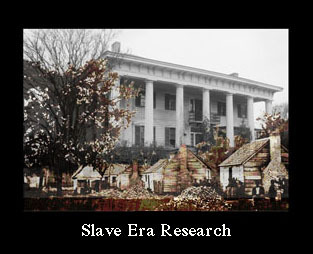 Willie Lee and Victor Tulane on the front porch of their house on Union Street in Montgomery. 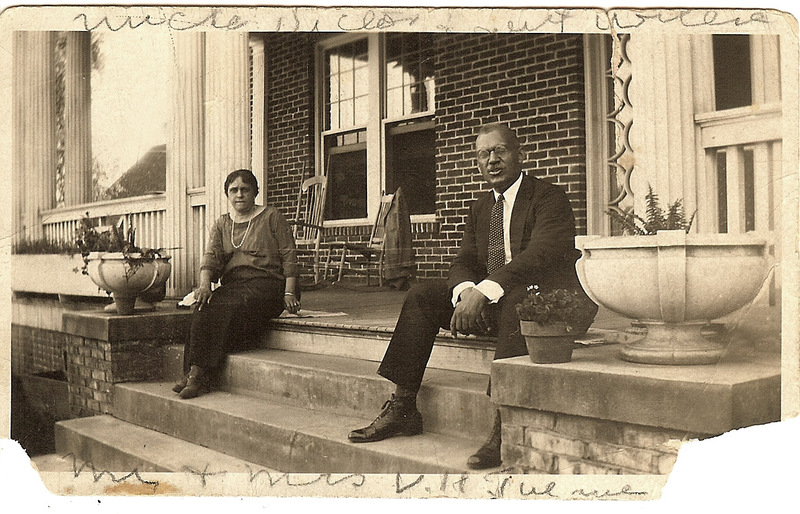 “Naomi sent this to me – Aunt Willie and Uncle Victor. She – beautiful and he -wonderful! !” in my grandmother Fannie’s writing. 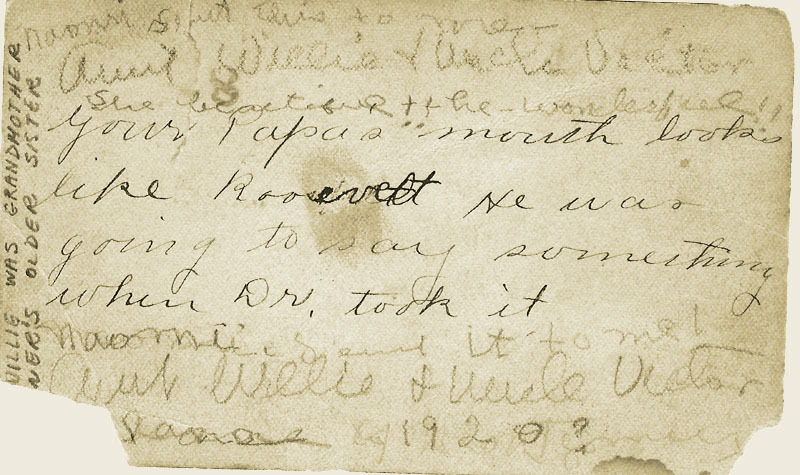 Your “Papa’s mouth looks like Roosevelt He was going to say something when Dr. took it.” I assume in Aunt Willie’s writing. “Naomi sent it to me. Aunt Willie and Uncle Victory (?) 1920?” again in my grandmother’s handwriting. Click for more Sepia Saturday posts click. It's true; he does look a bit like Roosevelt. They have a beautiful home. I think it's interesting that they are sitting on opposite sides of the porch. I have never seen a photograph of her smiling. I think she was a very sad woman. I noticed on your bio that one of your favorite books was Kristin Lavransdatter. It's one of my favorites, too and was one of my mother's. She wanted to name me Kristin but got voted down by the rest of the family. So I became Barbara. But I see that you became Kristin. You were luckier than me. I love the name. I'm just starting to read about your fascinating family. Welcome to Sepia Saturday. I've been absent for a few weeks. I am enoying sepiasaturday. my father's side of the family all read Kristin Lavransdatter. One of my uncles suggested the name for me. I even made a trip to Norway and visted some of the places in the book and slept in Sigrid Undset's bedroom in 1981. But that's not this blogs story. The days of sitting on the porch are gone – a lost art. Glad you posted a porch picture! What a lovely looking home, this is a wonderful photo but I have never seen a photo with the couple sitting so far apart. Interesting. You are the second person to mention that. I will have to post more of their story. There may be some answers there. A second posting – a double treat. So glad we have you on board Sepia Saturday. What a great blog! I just love old photos! I have tons of them from my grandmother's family. I am slowly putting them in order as best I can, and putting them into an archival scrapbook. 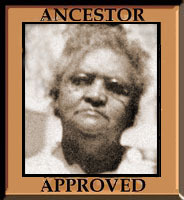 I want to start researching the family tree further back. i see i am not the only one obsessed with blogging!! nice to see you're covering it all. perhaps passion had left the building and they had become an estranged couple.